Online vacation rental sites include plenty of local options, from the luxurious to the humble. Acknowledging that they are playing catch-up on yet another high-impact issue affecting residents countywide, the Humboldt County Board of Supervisors voted unanimously Tuesday to jump into the vacation rental regulation business. “Currently, the county code is mute on this issue,” said Chair Mark Lovelace in introducing the discussion. “It is another issue that has been unregulated for far too long,” he added, referring to the board’s recent lengthy deliberations on cannabis cultivation. The vacation rental issue came to the board as a result of a petition by a joint private-public Vacation Home Rental Working Group, which developed and paid the costs of preparing a staff report to revamp county zoning. The county planning staff recommendation is that the county move to allow short-term rentals in residential zones anywhere in the unincorporated parts of the county, which would include communities such as Westhaven, where full-time residents have been increasingly vocal in their opposition to the “disruptive” vacation rentals in their midst. Under current regulations, rentals of less than 30 days are illegal except in a special zone created for inland areas of Shelter Cove in 1997. Even so, hundreds of listings pop up on short-term vacation rental websites like Airbnb and VRBO. All five of the supervisors had clearly been getting an earful from constituents on both sides of the issue, which pits property owners and rental managers against residents who say their neighborhoods have been invaded by noisy, inconsiderate partiers. Steven Santos of the county Planning and Building Department said one measure of the growth of unregulated short-term rentals in Humboldt County is the number of noise and nuisance complaints about vacationing renters, which rose from two during 2010 through 2014 to six in 2015 — a number that prompted raised eyebrows among some in the audience. Many of these were from Trinidad residents, including Trinidad Planning Commissioners Michael Pinske and Richard Johnson, who have been on the receiving end of many more than six complaints in recent months. Some 30-plus residents turned out for the public hearing on the vacation rental issue, but the supervisors didn’t wait for public comment to indicate the board’s intentions. Once the planning staffers had concluded their presentation of the proposed regulation issues, Fourth District Supervisor Virginia Bass offered a motion to move forward with designing an ordinance. 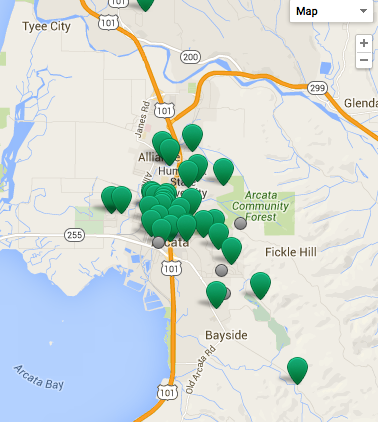 A quick searched yielded plenty of short-term vacation rental options. 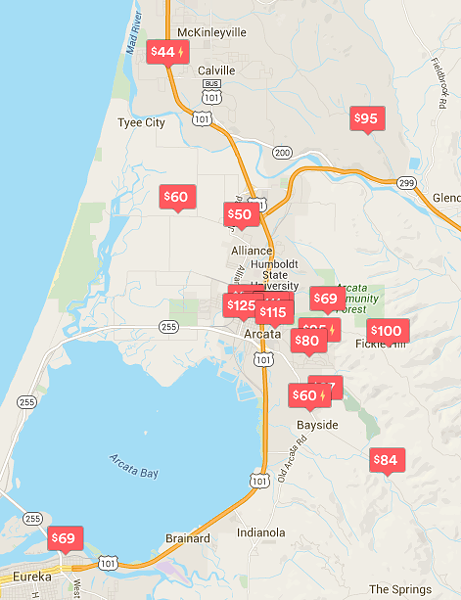 Supervisor Ryan Sundberg, whose Fifth District includes Trinidad, Westhaven and McKinleyville, where the complaints against short-term rentals have been loudest, agreed that the planning commission should take up the issue as soon as it can. “There are some real neighborhood impacts that need to be addressed,” he said. But when residents rose to be heard, most of the 16 who spoke Tuesday supported the county’s move to regulate and regularize short-term rentals as an integral and growing part of the county’s tourism economy. The planning staff report supports Woods’ argument, citing county income from tourism rising more than 40 percent from 2012 to 2014, when it brought in an estimated $1.8 million in county taxes. But Victor Stratman, of McKinleyville, one of those speaking against legalizing vacation rentals, said they have unseen costs. Stratman and 10 of his neighbors in the Pacific Sunset subdivision on the west side of U.S. Highway 101 said in a petition opposing the zoning changes that a single short-term rental had disrupted his entire neighborhood. “We feel they are a commercial enterprise similar to a motel” that has no place in a residential neighborhood, he said. She and others welcomed the county’s arbitration and regulation of a “grey area” that leaves both people who want to rent out their property and their neighbors confused about the rules, requirements and enforcement. Don Allen, of Westhaven, said that although vacation rentals can and have created a lot of problems, such as noise and traffic, “a lot of issues could be resolved by having on-site managers” required at all rentals, a position that many in the audience and on the board seemed to support. Mike Reinman, owner of Redwood Coast Vacation Rentals, and Reid Kitchen, co-owner of Trinidad Retreats, both said property managers are on call 24/7, and that their rental contracts are “very strong” regarding tenant behavior. “A small, vocal, anti-vacation rental story is being told that can often be incorrect,” Reinman said. “Having these regulations in effect could limit complaints,” adding that, last year, 14 complaints were recorded from more than 18,000 nights of rentals. The issue now returns to the county planning commission, which will begin work devising regulations that address these kinds of concerns as well as issues of density or vacation rental “clustering,” water, sewer, power, road and other infrastructure requirements, as well as preparation for hearings on the proposed ordinance before the California Coastal Commission. Meanwhile, the Eureka Planning Commission is slated to take up the issue of a citywide ordinance at its meeting Monday. The staff report generated for the meeting notes that short-term vacation rentals currently aren’t an allowed use in any of the city’s zoning districts but estimates there to be 30 to 40 vacation rentals in the city. The city of Trinidad was the first local municipality to dive into the vacation rental fray, an effort that was the subject of our Dec. 10 cover story, "For Rent." And we took a broader look at the world of online vacation rentals in our July 17, 2014 cover story, "My House is Your Hotel."